The weekend's finally here, and it looks like it's going to be sunshine. We did the mowing and edges last night, so half the chores are done. If only a magic fairy would clean the house I would be so gratefull, only problem Cinderella will be doing all the cleaning and cooking. 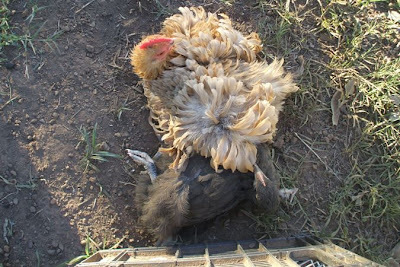 They look a little like dead chooks! but they very much alive. These chicks are so ugly atm but give them another 2 weeks to get all their new feathers and you'll see just how cute they really are. And then we should be starting to tell if we got pullets or little roo's. Which we will then fatten up for roast dinners ... Say's the brave one. We might even need another extention, better not mention it to Dear George yet. He grumps that I always have another project waiting before he has a chance finishing the first one ... maybe he better work faster. Will take photos as we progress for you. Have a lovely weekend. I don't know if I could eat what I took care of - just not sure.